Here's some code I wrote a couple days ago to demonstrate efficiently reading files on Windows by mapping views to the file into memory from a mapping object. It's pretty basic -- I can read a ~2.5 Gb file in about 5 seconds. Performing other things during the read is obviously going to increase that timeframe a little. ^ For this test I just took an ISO/Image for Windows 7 installation that I had on a USB. 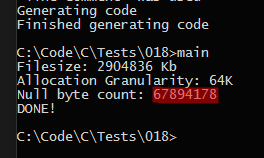 It reads through the file and counts null-bytes.